Spray a 9x5 inch loaf pan with cooking spray. Line the pan with a strip of parchment the width of the pan long enough to hang over the sides a bit. Spray parchment with cooking spray. Set aside. In bowl of stand mixer combine first five ingredients (flour, brown sugar, baking powder, baking soda and salt.) Stir until mixed together evenly. In a medium sized bowl combine the blueberry puree, melted butter, eggs and vanilla. Whisk together until smooth. 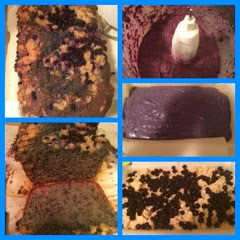 Pour the blueberry mixture into the dry mixture and mix on low until batter forms, scraping the sides as necessary. Batter will be purple! Pour this into your prepared pan. To make the crumble topping combine all the Crumble ingredients together with a pastry cutter or fork. You can even use you hands to create large sized "crumb topping" if desired. Sprinkle this over top of your batter. Scatter reserved blueberries on top of crumble and bake for 50-60 minutes until center is done. Allow to cool for 15 minutes and then remove bread from pan and cool completely.